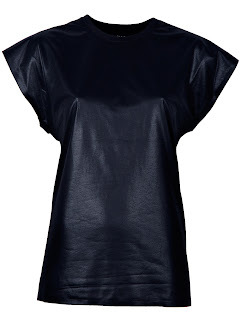 Shallow Obsessions About Fashion: Leather tshirt - would you wear one? When it was highlighted as a trend this past spring, I didn't care for them. But does it ever happen that you start liking things that you at first scorned? This is the case here. Why I am drawn to the boxy, no shape, pseudo-unflattering silhouette a leather tee is beyond me. There's no rocker child that needs to come out. Lords knows where I would wear it... all I know is that I desire to have one!